The staff of Rausch Funeral Home takes this concept seriously – a funeral is a time to honor the life of the deceased and celebrate the heritage of their family. We strive to make each funeral a respectful, fulfilling experience that meets the unique needs of each family. No matter which facility you may choose, the Rausch Funeral Home family is ready to assist you at your time of need. If you are interested in pre-planning a funeral, or if a death has occurred, the experienced and compassionate staff at Rausch Funeral Home will provide the finest and most affordable funeral and cremation service in the region. 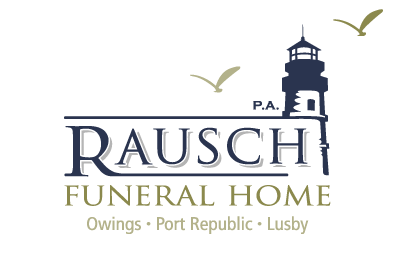 Rausch Funeral Home..During a difficult time...still your best choice. Now Featuring Rausch Crematory, P.A., Calvert County’s Only On Site Crematory.